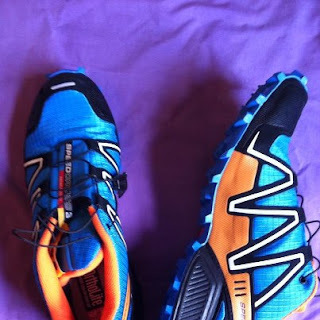 Let’s see if I can be a little more vigilant in keeping this blog up to date, without the four times a week running and without the 4 hour long run commitments it may be a little easier but as the training for the Oxfam Trailwalker kicks in the hours may (again) be spent on my feet and not in front of the computer!!! My post marathon physio visit consisted of a diagnosis of inflamed muscles either side of the shin (possible tendonitis he said), electrode treatment – on the leg not a la “One Flew Over The Cuckoo’s Nest”, although some could quite rightfully argue that this type of treatment could improve me overall – and some ultrasound with clear instructions not to run or do long walks for two weeks. Since then things have improved considerably with the anti-inflam medication being reduced to zero and the pain disappearing. Luckily I’ve followed his instructions, to date, as things did feel normal on Friday and I could well have gone for a quick 5km run with dire results. 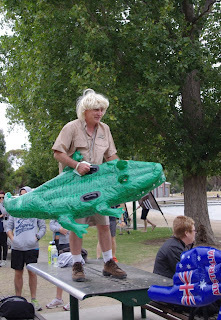 Instead I volunteered at the local Albert Park parkrun, where I was allotted timekeeper duties again, and as it was our National Holiday, Australia Day I dressed as the Crocodile Hunter Steve Irwin and gave all 144 runners an educational speech on the dangers of crocodiles, with global warming and all you never know when they may suddenly appear in these more temperate areas. Oxfam Trailwalker planning has commenced with a team get together and dinner (got to carb load) on Tuesday evening, where we cornered one unfortunate co-worker into volunteering for our support crew (the following day I managed to rope in another two so we are all supported and willing to hit these trails). Besides discussions about what type of gear, food, hydration etc. our meeting was very fruitful in that we came up with a team training plan for four long walks together, meaning individually we will need to fit in the other training to ensure we are all ready to walk 100kms in 81 day’s time. 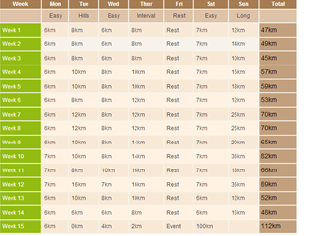 The recommended training plan is below, a mere 864kms to get to the starting line – ouch. Our group plans are an evening (after work) walk this coming Friday, of 10.2kms along the most challenging part of the trail (very steep and the hardest ranked part of the course), a night walk along another of the most challenging parts of the course (so we can test our abilities with head lamps, darkness and tiredness – will we be yelling at each other come 2am???) of 27.7kms three weeks later, an early start walk of 37.2kms (a fortnight later) taking in the same section we will do for walk one, and adding a further 27kms down the hills and flat, and finally (another fortnight later) a 40.5km early start walk taking in the final sections of the walk, some flat some challenging. Come the event itself we will have walked most of the trail besides the first couple of sections which are flat and we’ll be all pumped up for those and will be able to complete them quite easily, safe in the knowledge of what is coming up over the hill (or mountain) quite literally. This week the weather forecast is for rain all week, with the prediction of thunderstorms on the day of our walk. It will be a test of the team’s mettle to even get to the start line on the walk, and a massive test if the trails are all muddy and slippery, however there is no way of predicting what the weather will be like during the event itself so personally I think the training should go ahead (maybe not if there are lightning strikes all around us), that way we are fully prepared if the event is a wet one. If it is a dry event we’ll be even more chuffed as we know we can walk those sections under harsher conditions. Finally onto the gear, I own the majority of the recommended gear but need a decent backpack, trail shoes and a jacket. I went trail shoe shopping yesterday and have myself a new pair of Salomon Speedcross 3’s, they are so bright that if we go missing the aerial search parties should be able to spot us on the tracks. They’ll be put to the test this week – can’t wait. I’ll keep you up to date with the training, the fundraising, the events we will organise to assist our fundraising and more via this blog – it is subtitled “other charity driven insanities”.